The Faculty of Theology participates in publishing a theological quarterly Studia Theologica (in the Czech language). In cooperation with the Joint Research Group for the Study of Post-Mediæval Scholasticism of the Institute of Philosophy, Academy of Sciences of the Czech Republic, the Faculty publishes a philosophical journal Studia Neoaristotelica; two issues per year contain articles written in English and in other main European languages, one issue is published in Czech. 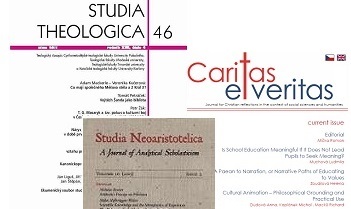 Finally, our Faculty publishes its own semestral on-line journal Caritas et Veritas, dedicated to Christian aspects of social sciences and humanities. All studies are published both in Czech and English.